The Toshiba IPedge integrates multiple communication applications on one optimized server platform. Standard applications include call processing, voicemail, and centralized system administration. Optional applications include unified messaging, meet-me audio and video conferencing with web collaboration, and a Call Manager unified communications client application. Running multiple applications on one unified server, instead of requiring an individual server for each application, delivers significant savings on equipment purchasing and ongoing maintenance costs. The Toshiba IPedge helps you stay connected to your customers no matter where you are, keeping employee productivity at its peak. Each user can select the endpoint device that meets their specific need. 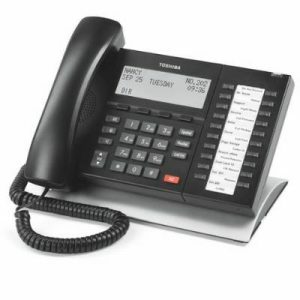 Choose from a complete line of Toshiba IP desk and wall-mountable telephones, SoftIPT™ soft phone on notebook computers, wireless IP telephones for use over your Wireless LAN and/or your cellular service, add-on modules, DSS consoles, attendant consoles, as well as SIP telephones and analog telephones. With its intuitive interface, IPedge couldn’t be easier to use—it matches the way your employees use the telephone. The easy-to-read LCD display features simple instructions and voice mail controls right on the screen, and programmable buttons put your most utilized features one touch away. 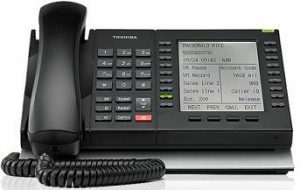 Toshiba’s powerful Call Manager application lets you combine the capabilities of your computer and Toshiba telephone into one powerful communication tool. Use your mouse to dial, answer, transfer calls, and more—without ever picking up the phone. CRM integration provides screen pops with programs such as SalesForce.com, Act!®, Microsoft® Outlook™ and more. Use your PC for Chat instant messaging, broadcasting messages to multiple users, and simultaneous Chat sessions. Presence capabilities let users see the current status of co-workers, quickly transmit important information, and best serve customers through an easy and intuitive unified communications interface. The Toshiba IPedge powerful lineup of wireless capabilities integrates a variety of voice communication devices and applications over your IP network, making it possible to extend full telephone mobile functionality to local and remote users. The IPedge Meeting application provides dial-in audio and video conferencing and web collaboration with scheduling, desktop sharing, conference recording, usage reporting, and more. It’s web-based, so users can attend a collaboration session from anywhere via the network, and dial-in to an audio conference from anywhere via the PSTN. Plus, users’ PCs do not require installation of client software—all they need is Internet access. Integrated voice processing applications help you improve customer service by providing callers with instant attention and access to information. Voicemail is built right into the IPedge, with no additional equipment necessary. And it’s flexible, enabling you to tailor your voice processing as needed. You don’t need a large call center to manage your calls and call distribution. Toshiba’s contact center solutions serve customers quickly, efficiently, and cost-effectively, providing a competitive advantage, no matter what the size of your company. Today’s business environments place heavy demands on PCs, firewalls, printers, and especially your telephone system. Enjoy the benefits and security of knowing that, with Toshiba’s Survivability solutions, your IP telephones will continue to operate 24/7. The Toshiba IPedge has the ability to automatically re-register to a secondary system if the primary system fails. Plus, survivability is scalable from one IP telephone to some or to all the IP telephones in the primary system. Choose survivability for key individuals, specific departments, or all users within the system.